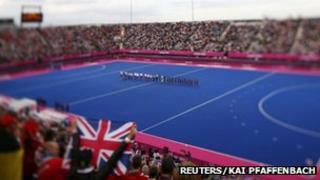 The blue and pink hockey pitch used for the London 2012 Olympic Games is to be moved to Sheffield. The city's hockey club was chosen to be the new home for the artificial turf out of more than 40 applications. It has been removed from the Riverbank Arena at Olympic Park and will be stored until spring, when it will be installed at Abbeydale Sports Club. The 2013 School Games, held in September, will be the first major event to use the turf in its new home. The pitch was donated by the London Organising Committee of the Olympic and Paralympic Games (LOCOG). LOCOG chairman Seb Coe said: "This is an example of the legacy of London 2012. "The pitch will be used by both the local community and elite hockey players as well as for the School Games. It will also give the club a piece of Olympic history." Roger Lomas, director of Abbeydale Sports Club, said he hoped their existing surface could create a legacy of its own. "That surface may find another home in a third world country... rather than going on to the scrapheap there may be a home for it somewhere to help develop hockey somewhere else in the world," he said. Sally Munday, chief operating officer of Great Britain Hockey, said: "We are pleased to see a community club such as Sheffield Hockey Club offer a home to this iconic pitch." Did GB hockey hit the target?